Safety Scissors have comfortable handles and a rounded tip for added safety. The small nail clipper edges are curved for safer trimming. 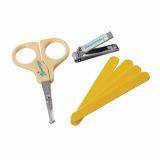 Set includes scissors, nail clippers, and 4 emery boards. 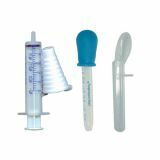 3-piece set contains medicine spoon, medicine syringe and medicine dropper– everything you need for those stressful times when your little ones are unwell, injured or teething. Nasal Aspirators help relieve baby's nasal congestion by gently drawing mucus from the nose and reducing the discomfort of cold symptoms. Comes apart for easy cleaning. Extra large easy to read display. Oral reading in 8 seconds! 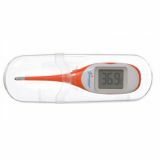 Fever Alert Light Up Indicator – display panel will turn red if fever is detected and green if a normal temperature. Flexible tip for comfort. Case for hygienic storage. Contains no mercury. Long life battery. Celsius and Fahrenheit. Temperature range 32.0 - 42.9 C (90.0 - 109.4 F).